Families of those on board HMS Ocean are preparing for her arrival home to Devon after the war in Iraq. She arrived off the South West coast on Tuesday and is due to take part in a formal homecoming on Wednesday. Britain's biggest warship left Devonport in January. At that time, her crew and those on board were uncertain of her deployment. 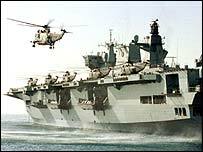 During her period in the Gulf, HMS Ocean achieved notable success - helicopter crews were involved in securing Iraq's second city Basra. Royal Marines based on the ship took the strategically important al-Faw peninsula early in the fighting. Ocean's commanding officer, Captain Chris Clayton, said of her impending return: "It's very exciting. We can see the coast of Cornwall, which means it's the last leg, and that soon we'll be back in Plymouth. "There are mixed emotions, I have to say. There's excitement because people are going to see their families for the first time in five months, and so the euphoria of that is already beginning to seep through the ship. "There's also a sense of pride in a job really well done. This ship played a major role in the operations out there. "But also we have to remember that we're the lucky ones coming back. Not everyone has. "There are many we have to think about, including one of our ship's company who was killed in action, Marine Chris Maddison. Our thoughts will be about him and with his family." HMS Ocean is one of several ships returning from the Gulf this week. RFA Argus and RFA Fort Rosalie are also due back on Wednesday morning after playing their part in the war in Iraq. RFA Argus acted as a casualty reception ship, treating injured Britons and Iraqis. RFA Rosalie kept the Royal Navy and the US Navy in food, fuel and spares throughout the operation.